Mary Spio went from being a barefoot girl in Ghana to a rocket scientist with major patents with Boeing. Mary is also an internet entrepreneur who speaks throughout the world about how anyone with a dream and some tools can harness the digital world for success and prosperity. In IT'S NOT ROCKET SCIENCE, she presents advice and empowering stories that will inspire readers to move beyond their comfort zones into mastery and empowerment. 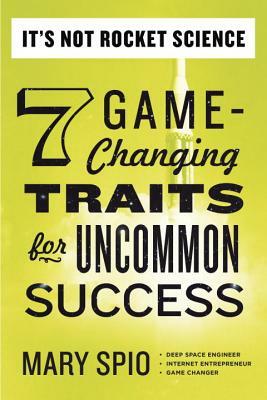 IT'S NOT ROCKET SCIENCE reveals the habits and traits of people who defy convention, overcome limited thinking, and crush the odds to achieve breakthrough success—and shows readers how to strike their own uncommon path. It shares the secrets to cultivating curiosity, creativity, compassion, audacity, passion, obsessive focus and tenacity to attain their dreams and change the world. It's not Rocket Science is an inspiring and entertaining read for anyone who desires to be empowered with the mindset needed to propel their life to new heights. • Learn how some of the world’s most successful people shatter boundaries. • Discover how your difference creates your relevance and your significance. • Uncover your inner spark and learn how to fuel your own flame. • Understand why a Defy-ing Moment is a defining moment. • Find your path to success –however you define it. Mary Spio is a lifelong game changer. Born in Syracuse, New York, to Ghanaian parents, she had humble beginnings growing up Ghana, West Africa; Mary didn’t see her first computer until she was seventeen. Yet she became a deep space engineer, designing and launching communication satellites. At Boeing, she helped pioneer digital technology that redefined how major motion pictures are distributed to movie theaters throughout the world. From there, she focused on her passion for matchmaking and founded One2One.com, a specialty media company dedicated to resources for singles. Mary also founded Gen2Media (now Vidaroo) an emerging leader in the digital media industry. Leveraging the power of online video, search and social media, Mary’s companies provide engaging user experiences for consumers and delivers quantifiable results for some of the most iconic brands, high profile entertainers and events in the world, including Microsoft Xbox, WalMart, Toyota, Coca Cola, Justin Timberlake, Will Smith, Britney Spears and The Billboard Awards Show. She is currently CEO of Next Galaxy Media.